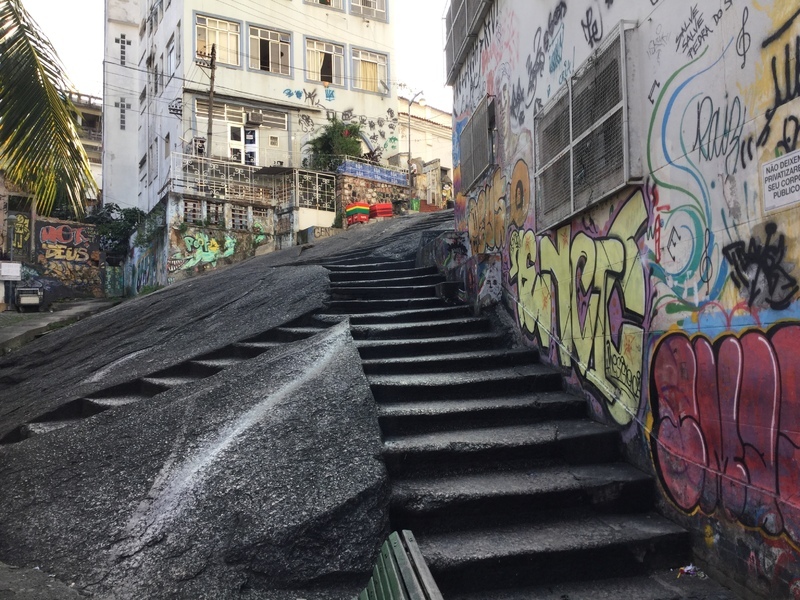 Of the estimated 10 million stolen Africans, about two-thirds disembarked in Brazil and likely half of them climbed these stone steps to face — depending on where they ended up and what type of work they were made to do — an average life expectancy of 4 to 7 years. The longest life-expectancy was about 15 years on a coffee plantation. The African slave trade in Brazil differed from that of the US in some logistical ways. One was that the captive African labor force was set up to be disposable. Slaves were relatively cheap, by comparison, and unlike the US, were generally worked to death and replaced. In the US, captured Africans were more likely to be considered as business investments, not unlike livestock. Another was the practice of escravidão de ganho or, the "earning" slave. These Africans had to get jobs. Their pay was either given directly to their captors or they were forced to make set payments to their captors, sometimes being left with a bit of money. This enslaved class differed from those sent to plantations or the mines in that they had full mobility in the cities. The typical jobs of "earning slaves" included unloading ships, carrying water to homes, general taxi/transportation and delivery of both goods and people, and construction. Due to this system of "earning slaves", many poor white immigrants, mostly Portuguese and Italians, came to Brazil and were able to build their wealth through buying one "earning slave" at a time, sometimes even working side-by-side with their captive to collect both salaries on payday. In this system, there was no requirement of the "masters" to feed or clothe their "slaves", as would happen on a remote plantation. The captors were, however, obligated to provide shelter, generally in the basement and with a straw mat. It is well known that most captives lived in collectives elsewhere, even if they were required to appear for bed checks. The "earning slaves" then became an integral part of communication networks among different groups of Blacks. They had a little money and they had personal property they could keep, if they could hide it well. It was not unusual for groups of these workers to form freedom pools amongst themselves, collectively contributing small amounts of money to a fund to buy each others' freedom in turns. To see the evidence of this system of escravidão de ganho, one only needs to notice who the bus, taxi and truck drivers are; who the construction workers are; who the garbage collectors are to this day. 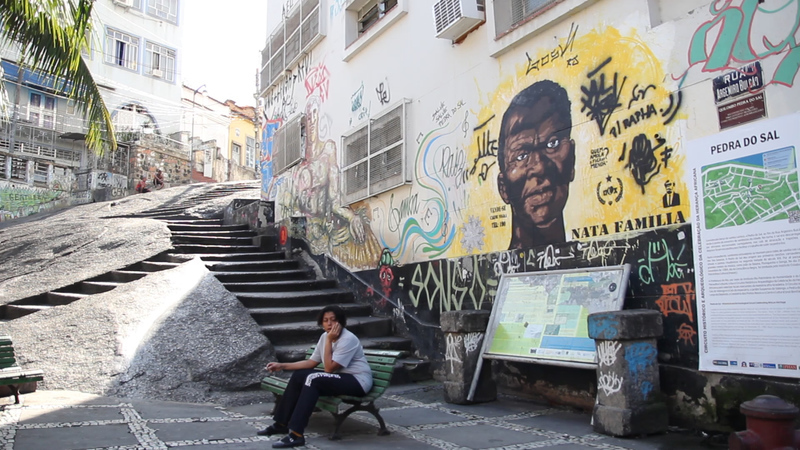 The neighborhood where we find the Salt Stone is the oldest continuously inhabited Black neighborhood in Rio de Janeiro. From the arrival of the first captured Africans, this small region near the port provided a geological protection that one can plainly see upon approach to the Salt Stone today. The narrow, winding streets that feed deep inside the rock formations created a space where no white person would chase you. 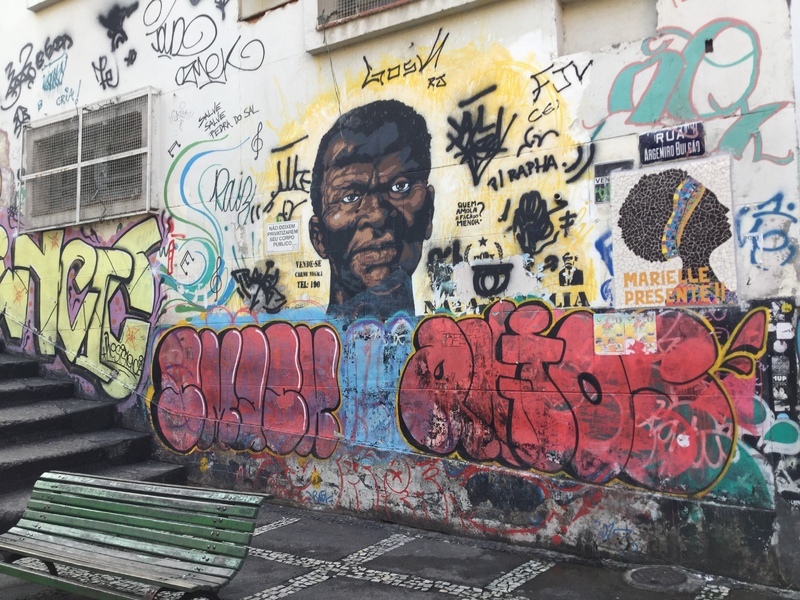 Known as Little Africa, the generations who inhabited this community for now 5 centuries, contributed the greatest cultural markers that continue to make Brazil a favorite touristic destination the world over. This community gave birth to Samba and to Carnaval. This is openly celebrated. What's much less known is that this community may well have been one of the first places where people practiced democracy in this new concept that would become Brazil, as they organized their social systems by voting. The social strata was defined by such markers as African born from Brazilian born (who, by-the-way, didn't much like each other); enslaved, born free, or manumitted; full-blooded or mixed race. The gender disparity in the trafficking of captured Africans was wide. It generally ranged from 3 to 4 males for each female. The enslaved women were primarily domestics, charged with not only cooking, cleaning and child rearing, but let's now say plainly that their sexual labor was also forced in these homes. These women had the highest rate of manumission, that is, they were most able to gain their freedom. When they were free, they had market skills and were able to make a living from sewing, cooking and selling foodstuffs, and of course, prostitution. With these resources, these women, called "Aunties", became the anchors of African and Afro-Brazilian social life. They had houses, they had food, and men would gather to eat, drink, talk, sing, drum, form freedom pools, and the like. They formed a government for their underground world, modeled after the Empire, and each year, they would vote for their kings, queens and courts. Over the centuries, this structure would become the Samba Schools we know today. So go and enjoy the birthplace of Samba, join the Monday night parties, dance, have a caipirinha.... and make some new friends! But while you are there, remember the centuries of Africans and Afro-Brazilians who struggled, fought, persevered, organized, innovated, developed, handed down their cultures, their science, their values, because those millions of Africans who walked up those stairs were not meant to come back, were not meant to stay, were not meant to still be here singing. Marielle Presente! 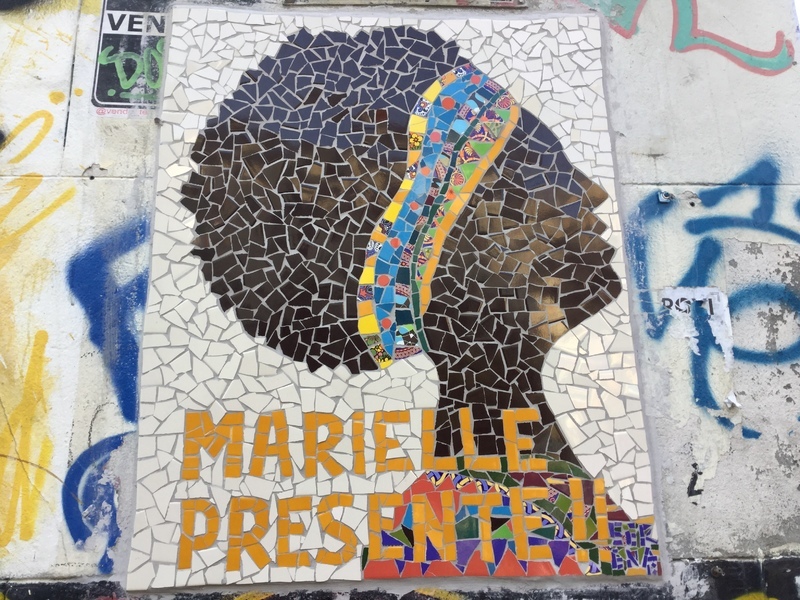 : This mosaic portrait of Marielle Franco is a new addition to the public artwork that defines the Salt Stone as a place of resistance for Rio's African and Afro-Brazilian community. Marielle Franco, born and raised in a Rio de Janeiro favela community, was the first Black Lesbian to be elected to the City Council. She was brutally assassinated in March, 2018 and as of this writing, ten months later, there have been no named suspects nor arrests for her murder. R. Argemiro Bulcão, 80 - Saúde ~ There is no specific street address for the Salt Stone, but this address should work in your mobile phone apps. 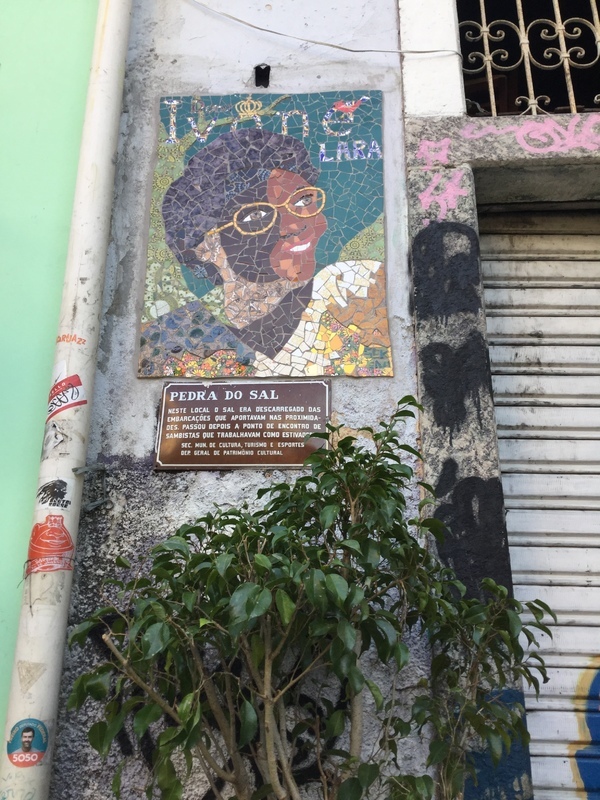 Sadakne Baroudi, “The Salt Stone,” Afro-Rio Walking Tour, accessed April 21, 2019, https://www.afroriowalkingtour.com/items/show/20.